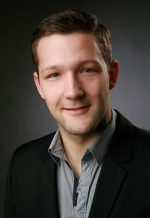 Richard Bieck studied Biomedical Engineering with a focus on biomechatronics in the bachelor degree at the Technical University of Ilmenau and graduated in 2012. He then studied Biomedical Engineering in a consecutive masters program at the University of Rostock, where he worked as a research assistant at the Biomechanics and Implant Technology Research Laboratory (ForBioMit) of the University Medical Center Rostock in the work groups „Numerical simulations“ and „Biomechanics“. His areas of specialisation were medical image processing, implant technology and biomechanics. He graduated with the thesis topic „Validation of A Statistical Shape Model-based 2D-3D Reconstruction for Computer Assisted Distraction Osteogenesis“ as an intern at the Institute for Surgical Technology & Biomechanics of the University of Bern. After his graduation, he joined the ICCAS in October 2014 as a research associate in the research group ‚Model-Based Automation and Integration‘. In 2015 he started working in the project BIOPASS as the acting project coordinator and developer for process module components. In 2016 he was assigned Quality Management Representative at ICCAS and contributed to the successful DIN EN ISO 13485:2012 certification for the development of medical device software. Since then he has maintained the quality management system and continued to supervise activities related to certified medical device software development.